Rolbaken, Norwegian for “rolling hills”, is an apt name for this little farm, which lies in the southwestern foothills of the Kammanassie Mountains. 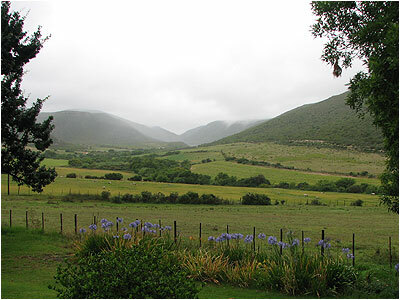 The farm nestles in a long valley, only 40kms from Oudtshoorn, and has magnificent views of both the Swartberg and Outeniqua Mountains. This spacious guesthouse is situated on top of a hill with panoramic views of the Swartberg, Outeniqua and Kammanassie mountains. It has its own well kept garden and is safe for children and pets. 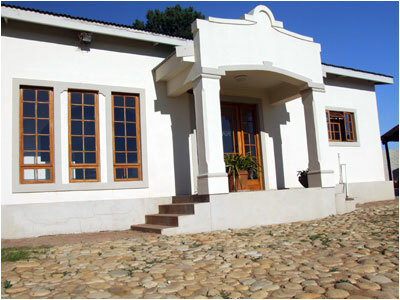 3 en-suite bedrooms , all tastefully furnished with antique pieces, dining room, comfortable lounge, fully equipped kitchen, braai facilities and large verandah. 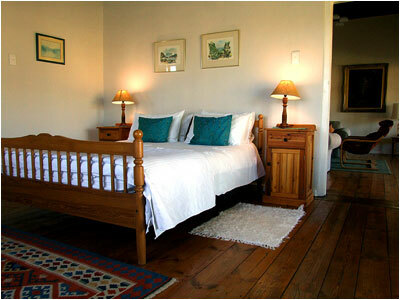 Guests can choose to self-cater, bed and breakfast or completely relax with dinner, bed and breakfast. All meals are delicious, traditional recipes and are chosen to suit your taste. 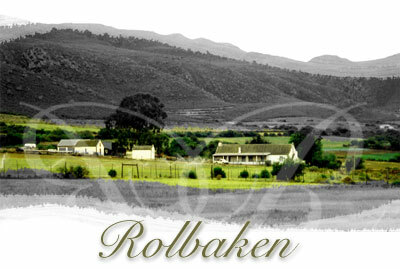 Rolbaken is the perfect farm getaway for families and friends. 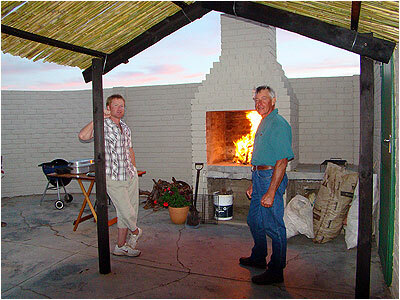 Just 40 kilometers from Oudtshoorn itself, the farm offers a place to relax, unwind and get away from it all, or serve as a wonderful springboard for exploring the area. 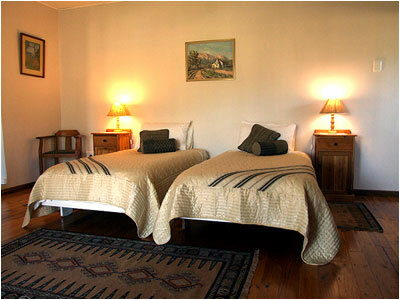 Only an hour�s drive in the other direction lies George, the sea and the Garden Route. To get to us, you will be traveling on a dirt road. It is perfectly safe to drive this in a 2-wheel drive vehicle as it is maintained regularly. 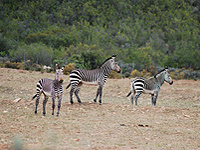 On the way to us, you will be driving through some of the most beautiful scenery in the Little Karoo, with red earth and aloes in abundance and fields peppered with ostriches and sheep. Zero your odometer at the Dysselsdorp turn-off from the N12. Cross the bridge over the river, turn left at 1.8 km. Sign says Dysselsdorp. Travel through portion of Dysselsdorp, tar ends at 2.5 km. Continue. At 3.4 km, opposite sports stadium, turn right (there is no road sign here). Pass through Dysselsdorp village. Drive with extreme caution - children. Leeublad Farm house at 19.7 km (please drive very slowly to prevent dust). Rolbaken Farm (KO 04) on the left at 21.7 km, just after cresting the hill. The guesthouse is the first house on the right. Follow farm road for 500 meters to the old white gabled house (second house). Zero your odometer at the Daskop turn-off from the N9. Travel for 11.6 km descending to the Kammanassie River. Turn left at the broken Dysselsdorp / Leeublad sign. There is an irrigation dam on the left. 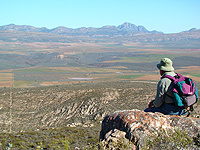 Cross the Kammanassie River and ascend the pass. After Koutie (KO 05) & the Scheeperskraal Farm School beware of an "S" bend over the top of a blind rise. Rolbaken Farm (KO 04) on the right at 31.2 km at the top of the hill after the "S" bend. The guesthouse is the first house on the right. Follow farm road for 500 meters to the white gabled house (second house). The road through Meiring's Poort, constructed by Adam de Smidt, was officially opened on the 4th of March, 1858.